The shot put will have one person that you better not miss out on. 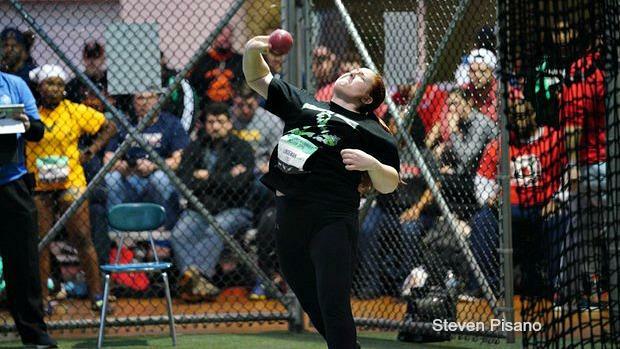 That young lady is Chloe Lindeman (Sr., Fulton) and she is the nation's top-ranked thrower. Fresh off of winning the prestigious New Balance Nationals Indoor title a few weeks ago, one would expect her to repeat as ITT champion without any resistance. Perhaps Lindeman's biggest challenge is the all-time record held by the great KD Young (Warrensburg-Latham) which is 49-1.25. Lindeman has thrown 49-8 and the ultimate goal is to top 50-feet. There is some depth with Saige Barnett (Sr., Bureau Valley), Claire Bushur (Jr., Teutopolis), and Hope Jackson (Jr., Riverdale) who all threw over 40-feet. It will be interesting to see which long jumper will clear the 18-foot barrier. It will be a challenge but at least the defending champion Faith Frye (Sr., Casey-Westfield) is back. Her season best of 17-3.50 may not be strong enough to challenge Kamryn Kolb (So., Bureau Valley) and her 17-7. Coming into the season, we all thought the pole vault was going to be a jam-packed affair. No so. Not now anyway because of Windsor Roberts (So., Tri-Valley) and her dominant ways. She has cleared 12-6 as a personal best. It happens to be the third-best effort thus far in the state. ITT seems to bring the best out of pole vaulters. There is another state leader that we think you will enjoy watching. She, of course, is none other than two-time high jump winner Daelin Switzer (Sr., Decatur St. Teresa). Switzer is capable of much more than 5-8. In fact, the time is now that the future Northern Illinois University product to threaten the 6-foot barrier this weekend. Defending triple jump champion Danielle Taets (Sr., Orion) sits nearly a foot back of Jaden Christian (Jr., Reed-Custer) and her 37-3.5 best. Taets happens to be the defending state champion in this event. The 3200m field is better than what is presented on paper. Expect the winner and leading contender to run much faster on Saturday. Ailey Mitchell (Jr., Shelbyville) could be in the clear if Katelyn Robbins (Sr., Liberty) does not challenge her early. Either way look for a time in the 11:20s. Former Urbana U-High star Arielle Summit has graduated and leaves a big hole for the participants in the 800m to fill. Marianne Mihas (So., Chicago Latin) is not entered so that means Gabrielle Alongi (Jr., Duquion) is the favorite. She actually has run 2:19.12 back in January at the U of Arkansas HS Invite. Several challengers such as Delanie Dykes (Sr., Gibson City), Breena Shreeves (Jr., Knoxville), and Maleigha Huston (So., Bushnell-Prairie City) will make things tough on Alonji. The best 1600m performer in the field is Ava Parekh (Fr., Chicago Latin) whose 4:58 full mile time converted would put her in a different atmosphere. Parekh is currently alpine skiing as her secondary sport. Fran Hendrickson (Jr., Champaign St. Thomas More) opted out of the deuce to race fresh. She will be incredibly hard to beat especially if Robbins and Mitchell attempt to double back. Kenli Nettles (Jr., Arthur) is lathered up and ready improve on her IL#3 8.90 in the 60HH that she set early in the season. So essentially she will be chasing former Salt Fork standout Jenny Kimbro's class record of 8.82. It has stood since 2015. Nettles will return in the 60m dash but a victory will not be so easy. Alyssa Busker (Jr., Aurora Central Catholic), Janiya Collins (Sr., Madison), and Faith Wyman (Jr., Wesclin) are all in the running for first place. MacLayne Taylor (Sr., St. Joe-Ogden) is right there too with an 8.14 clocking- same time as Wyman. Who will take the 400m? Can we say Nettles name again? She is nearly two seconds ahead of her nearest competitor Dykes. Wyman will return in the 200m as the slight favorite over Capria Brown (Jr., Danville Schlarman). This is the meet where we usually see teams break 10:00 in the 4x800. Duquoin has an eight-second jump on the second place team and they have Alongi as a serious insurance policy should anyone threaten. Harvest Christian Academy, Knoxville, and Pleasant Plains are those squads who plan on threatening Duquoin. There are four sections in the 4x200 and that's how long it is going to take before a team breaks 1:50. Take your pick between Bureau Valley, Warrensburg-Latham, and Duquoin. The race of the day will feature some interesting scenarios. Duquoin will have an opportunity to sweep the relays should they win the 4x400. It will not be easy Knoxville, Amboy. and Rockridge on the scene. A winning time under 4:12 will need to be negotiated for the winner.